That is not a typo. According to Yahoo! Sports, which quotes a report from ESPN’s Mark Saxson, the powers that be at MLB contacted Crawford’s agent about the cleats he wore in Monday’s loss to the Padres. 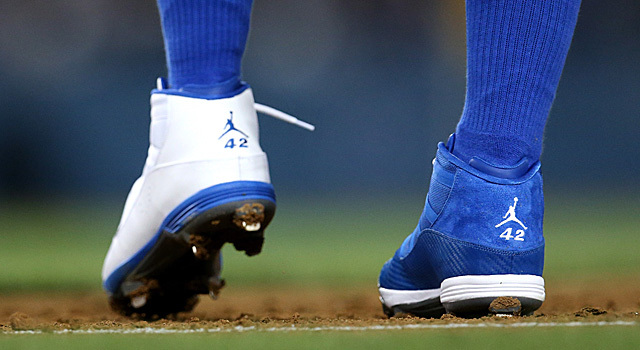 As you can see in the picture, Crawford (who, like many players on the team, received one pair each of blue and white cleats emblazoned with “42”) chose to wear one shoe of each color on Jackie Robinson Day. At the time it didn’t seem like a big deal. Actually, it seemed really freakin’ cool to everyone not wearing suits at MLB headquarters. For those of you who watch the NFL regularly, this stinks of a Roger Goodell influence. As a master conspiracy theorist, I will presume that Goodell got bored in the offseason, noticed Crawford’s cleats on TV, called Bud Selig, and threatened to put a bounty on him if he didn’t do something immediate, drastic, and douche-y about it. The more likely scenario, though, is that MLB struggled with a decision of whether to uphold their wardrobe policies, or ignore it as an exception for a special day. The fact that they gave Crawford a warning instead of immediately doling out the fine makes me think that a fine is less likely to come. We’ll see if Crawford is taking out his checkbook in the next few days, so stay tuned. But for now, we’ll add this latest nonsense to the long list of mishaps the Dodgers have accumulated as a clear target of MLB, the Diamondbacks, and Carlos Quentin’s. My team just can’t catch a break. If we could, we’d be 14-0! Shoot, there’s that conspiracy theorist in me again. Carry on. According to Deadspin, Arizona Diamondbacks owner Ken Kendrick doesn’t want your money. Okay, so that’s my conclusion. But still, the events that transpired in last night’s opening game against the Los Angeles Dodgers at Chase Field make very little sense. UPDATE (4/17/2013): Apparently Deadspin got in touch with members of the group who sat behind home. First off, I apologize for jokingly proclaiming them to be unloyal fans for caving to Kendrick’s wishes. They didn’t, until Kendrick threatened to have security remove them. Also, one of the group members was a terrified 7-year-old girl. Stay classy, Ken Kendrick. Read the new article, linked above, and tell me that Kendrick isn’t just out of his mind crazy? End/update. Due to the high visibility of the home plate box, we ask opposing team’s fans when they purchase those seats to refrain from wearing that team’s colors. During last night’s game, when Ken Kendrick noticed the fans there, he offered them another suite if they preferred to remain in their Dodger gear. When they chose to stay, he bought them all D-backs gear and a round of drinks and requested that they abide by our policy and they obliged. So if people see anyone not supporting the D’Backs in that frame during games on TV, does Kendrick think they turn the game off in a fury? Does he not realize that money is money no matter who spends it? Did he forget that many people consider their team affiliation and the gear they wear to support said team is far more important to most fans than where they are sitting? Buying a round of drinks for fans whose identities you are forcing to change (with their own money, probably) in the name of business may, in this case, actually be bad for business. At least Kendrick was gentle about the move. But does that mean it’s justified? I know that if I was among the group of fans there, I would have kindly told Kendrick to shove it and made sure I was in direct line of the camera all night. It seems fair to assume that most viewers of this situation on TV would quickly get past the confusion of the situation and recognize that those high-priced seats go to anyone who can afford them (as do any seats in any stadium), regardless of fandom. Calls to boycott Diamondbacks games among the Dodger faithful are already infiltrating Twitter. While that might be a little extreme for my taste, this move certainly won’t reflect well on the Diamondbacks front office in the eyes of the general MLB fan. Oh, and just for the record, those fans DID agree to change their gear. They have promptly been removed from the Dodger family. If you want a funny read, check out the reddit thread comments on this issue. What do you think? Is the policy legit? Vote in our poll below! Update (4/12/13): Greinke is out for approximately eight weeks. Quentin has been suspended for eight games, Hairston, Jr. for one game. Both of those players have appealed. This blog has already morphed and transformed 100 different times tonight as more and more details are released about the ridiculous brawl at Petco Park. We have embedded videos from sources like MLB and ESPN to give you a clear timeline of what went down. Enjoy the madness, and vote in the polls below! Different teams, a different division, in a different league; same matchup. In Greinke’s 2009 Cy Young year with the Kansas City Royals, he beaned then-White Sox Quentin in the 4th inning of an early-season game. 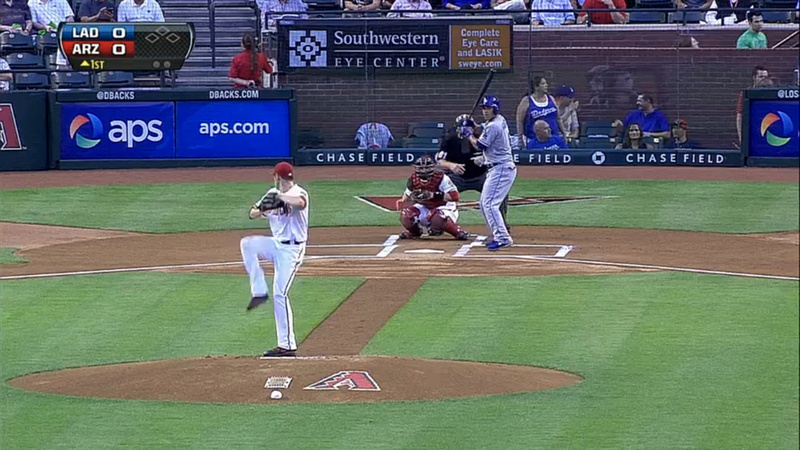 Quentin took a step toward Greinke before being cooled off and taking first base. So there was history. Whether or not it was intentional then, or intentional this year, is a matter we can likely never pinpoint. But in both instances, Greinke held a slim lead–hardly a situation in which you want to put anyone on base purposely. Unless Quentin slapped Greinke’s mother years ago for some unknown reason, there is no motive for Greinke to throw at Quentin in the first place. Not to mention, that little dust-up was four years ago now. That’s a long, long time for someone to hold a grudge in sports. 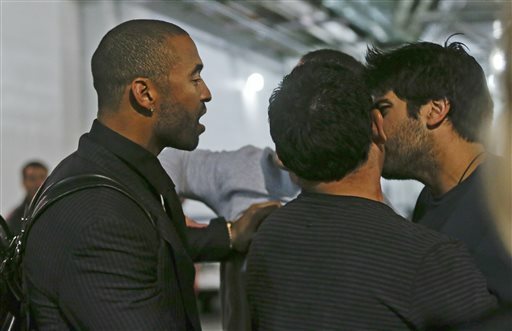 In the video of the fight, you can see Matt Kemp going absolutely bonkers in the scrum (kerfuffle, if you will). At one point, he had multiple teammates restraining him after getting in a face-to-face shouting match with Padres manager Bud Black. After it looked like the dust had settled, Dodgers utility man Jerry Hairston, Jr. took off toward the Padres dugout with his finger pointed at someone. If Don Mattingly’s postgame comments are any indication, the Padre in question was backup catcher John Baker, who was raised in my hometown of Walnut Creek, CA and does not seem the type to be involved. Losing Zack stings, but we ll pick each other up. Zacks like my little brother. Saw someone making fun of him being injured.Not cool!! Finally, the skirmish ended and Greinke was walked off the field by head trainer Sue Falsone. The umpires eventually ejected the pitcher, along with Quentin, Kemp, and Hairston, Jr. Shortly thereafter, Chris Capuano relieved Greinke on the bump for Los Angeles, and promptly allowed a game-tying single. Though the unlikeliest of heroes, Juan Uribe, went deep later to help seal a 3-2 victory for the Dodgers, nothing could take the sting out of the news that broke after the game. BREAKING: Zack Greinke suffered a fractured left collarbone. So needless to say, Mattingly was upset with the result of everything except the win. When pressed about the incident, Mattingly referred to Quentin as an “idiot” who has “zero understanding of the game of baseball,” given the situation in which he charged the mound. Most shockingly, the skipper also declared that Quentin deserved to be suspended for as long as Greinke was on the shelf. Many writers on Twitter agreed with this sentiment, and yours truly can’t argue the idea. Of course, Quentin won’t get a lengthy suspension. Chances are, he’ll be looking at a four or five game suspension at the most. But we will have to wait and see what kind of action the league decides to take, and also to see if they discipline Kemp for his actions. A.J. 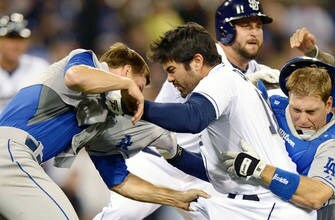 Ellis said #Padres players apologized for Quentin’s actions. “It’s not right, it’s not right,” he said one player told him. Kemp and Quentin face to face in the hallway. The Associated Press was able to snag a picture of the two players arguing (see below) before they were separated. The scene could have gotten much uglier, but it was luckily diffused in time. On one hand, you have to admire Kemp’s willingness to defend his pitcher and not back down from what he considered a threat. Leadership like that can pull a team closer together. 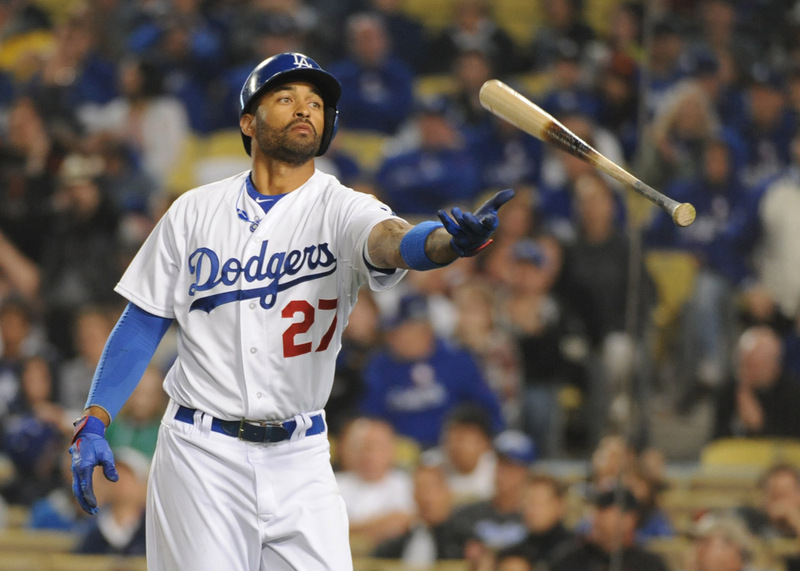 But on the other hand, the last person the Dodgers need getting suspended or playing upset is Kemp. The star center fielder is already struggling with the bat so far in 2013, and needs to recognize the difference between playing hard and playing pissed. Cast coming off today!!!! Thanks god!!!!! At the very least, that series will be under an intense microscope by fans, players and journalists everywhere. For the Padres, a chance to be relevant. For the Dodgers, a chance to prove that they are more than a rich all-star team–that they can win with talent and heart and team chemistry. Stay tuned to Three Up, Three Down for more coverage as the news continues to roll in. Please vote in the polls below, and feel free to share your comments with us, too. 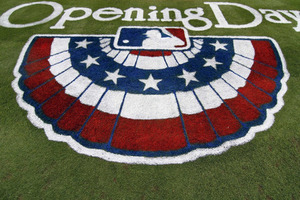 Follow @3u3d on Twitter and LIKE us on Facebook at Three Up, Three Down for all your breaking MLB news! “Can I ask you an honest question, between you and me? 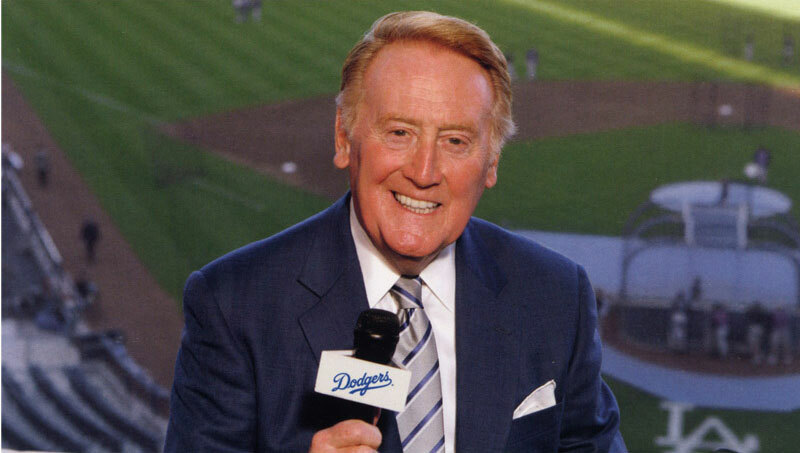 What in the world is “hashtag?”” – Dodgers announcer Vin Scully. This golden nugget of greatness occurred before the bottom of the fourth inning began at Petco Park on Wednesday, in a game that the Dodgers would eventually win 4-3 over the Padres. Scully’s ability to be at the top of a difficult profession for decades upon decades and master his craft with grace, style, and accuracy is why he will forever be remembered as the greatest announcer who ever lived. The fact that Scully was able to tear viewers’ eyes away from game action to tune in with full attention to his brief tangent and end up just smiling with amusement, is beyond impressive. He has the charm of a guffawing grandfather, the wit of a very old fox, and the voice of God (sorry, Morgan Freeman). Go ahead and watch the clip linked below and try not to smile as Scully giggles and gasps his way through a very troubling set of questions for someone who was born when Babe Ruth was still playing (though I’d argue his general knowledge of all this doggone technology us whippersnappers use these days is far superior to most people his age). And, in fairness, the questions remain–what IS a hashtag? They really don’t make sense, beyond the “trendability” of such things. And though DirecTV’s concept is marvelous, what happens to my poor cat when all he sees on the tube all day is those dumb dogs chasing their tails? I can only imagine. Take a look at Vin’s hilarious diatribe RIGHT HERE. Is this one of the best announcer moments in recent memory? Tell us in the comments below! Oh…and for what it’s worth? After Scully’s little speech, #VinScully began trending on Twitter. Naturally. 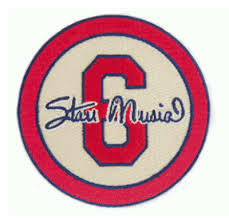 Follow @3u3d on Twitter and LIKE Three Up, Three Down on Facebook for all your 2013 baseball news!